MRI Day 9-3-14 - Adventures with the Tuleys! Josiah had his MRI on September 3rd and everything looked great! Josiah sat well for his vitals, and had a nice chat with the nurse. He’s changed quite a bit since being there, which is just crazy to think about. When it was time to get height and weight he walked right over to the scale and hopped on, then went to the wall to be measured. He weighed 10.4kg and was 84cm in length. On his last day of chemotherapy, which was May 19th, he weighed 9.3kg and was 80.5cm. So in 3 months, he’s gone from 31½ inches to 33 inches and 20.5 pounds up to 22.9 pounds! Josiah went to the toy room to play, found the shopping cart and pushed it out into the hall into the main area. There, the nurse practitioner walked by and told him she was going to come see him in the room in just a minute. He stopped, looked up at her and very firmly and loudly stated “NO!” and went on his way with the cart saying to himself, “No turning back. No turning back.” His favorite song these days has been “I Have Decided to Follow Jesus.” Apparently he’s learned to apply the words to other situations! I “helped” the cart go into the room and he did well, although he was unimpressed with the interaction. The MRI was scheduled for 10, but because the one before us was cancelled, Josiah could go at 9:15. He wasn’t impressed to ride the stretcher this time for some reason, but did it anyway. The MRI went well and we were back up to the unit about 45 minutes later. The nurse needed more blood, which she was having trouble getting; so with all the movement Josiah awoke fairly soon after. We did have his breakfast ordered so when they were done we immediately gave him his food, which made him very happy. When it was time to go, we went to an exam room to remove the IV. While the nurse was taking out the IV, we were talking with the child life specialist. She was asking if we had received a blanket, and also asked if Josiah would like a stuffed puppy. Josiah was listening closely, and yelled out “I want a tractor!” We laughed and I gently told him that they had a puppy, and asked if he would like one. This time his yelling turned to crying and frustration as they were taking off the tape from his IV and he yelled even louder “I WANT A TRACTOR! I WANT A TRACTOR!” The child life specialist looked around and said, “I’ll go find a tractor” and left the room. Josiah cried and fussed until child life came back in the room with a green John Deere tractor still in the box. Josiah immediately stopped crying and happily said “a tractor!” then wanted it out of the box. As the nurse worked on the IV, child life and a student worked on quickly extracting the tractor, using the nurse’s scissors. Both finished at the same time, making Josiah even happier. He toddled out of the room with his tractor and was very happy. We left and grabbed some lunch and ran by the store before it was time to see the neurosurgeon to find out the results of the MRI. She came in the room and Josiah was asleep. He actually slept through the whole appointment. She told us that the MRI looked good and there was no evidence of recurrent tumor – which basically means there’s nothing new or growing back. That was such a relief to hear! That put a huge smile on my face, and really, just made my day. 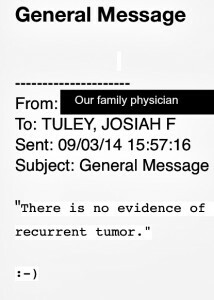 Because even though I already knew the results, it’s awesome to know that while our family physician isn’t a regular part of the cancer/chemo/MRI process, he is keeping up with Josiah and was thoughtful enough to let us know. So another wonderful day, and another 3 months of normalcy! Next MRI…December 3rd. God is Good! All the time!